Avail from us a range of high performance Aluminum Foil Sealing Machines. These Foil Sealing Machines are manufactured using latest techniques and premium quality raw materials assuring their high efficiency. 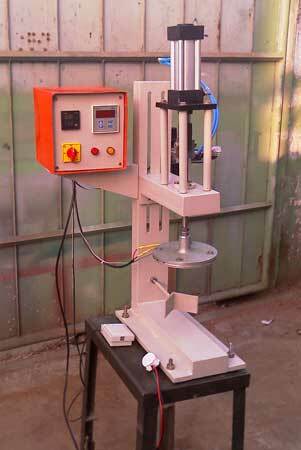 This machine is operated with the help of foot switch and continuous heating process. Also, it requires 6 kg pressure air for the pneumatic cylinder to work properly. We are counted as one of the prime Manufacturers and Exporters of Aluminum Foil Sealing Machine in India. Sealing foils of various diameters Seals ranging from 25 mm to 150mm (also, dia more than this can be also be made).